Skateboarding is a sport, an art form, a lifestyle, and a culture that young [at heart] people have been doing for decades. But you don’t have to have sleeve tattoos, wear baggy pants and do tricks to benefit from this fun activity. Skateboarding is not only healthy and fun to do, but it’s also quite a practical way to get from point A to point B, especially if you get good at it. So, let’s take a closer look at all of these benefits. While it's not as efficient as burning calories through running (about 680 calories per hour) or even active yoga (Vinyasa Yoga burns almost 600 calories per hour), skateboarding can still help you shed about 340 calories per hour, so it's worth adding it to your exercise routine. Also, if you do tricks on a skateboard, which requires some serious skill, it will, in turn, work your muscles, including the core muscles, quadriceps, hamstrings, gluteus maximus and your lower legs. It builds stamina and flexibility. Most skateboarders don’t just skate for five minutes and stop. They find it so enjoyable that they skate for hours a day, getting their physical endurance levels up. Also, there are only a few other sports that involve the use of your whole body as skateboarding does. When you skate, you need to move every part of your body and in all sorts of directions. You move your feet, legs, and core for balance and arms to add momentum. It’ll make you twist your whole body which will make you very flexible, and the more flexible and relaxed your body is, the easier it is to skate. It relieves stress and depression. While every physical activity is good for relieving anxiety and stress, skateboarding can be especially powerful. Some people who suffer from anxiety report that replacing their therapy counselling with skateboarding additionally reduced their stress levels. 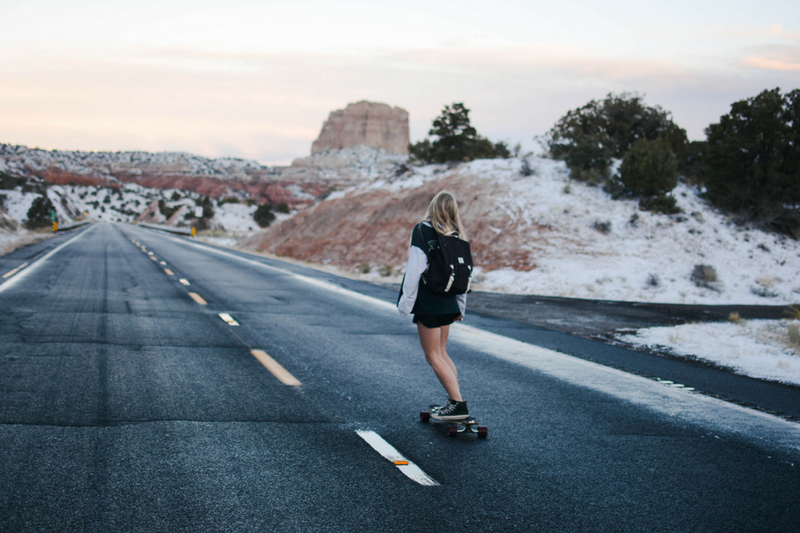 The reason that skateboarding works so well is that it frees your mind and brings things into perspective, and it allows you to feel as though you’re more in control of other aspects of your life. Plus, doing tricks builds confidence and brings a sense of accomplishment. Even though there are no formal studies conducted on the relationship between skateboarding and depression, people report all sorts of benefits. Skateboarding keeps the mind busy, and riding out in the sun and fresh air makes you feel better instantly. It’s a great way of transportation. Skateboarding is now an integral part of the urban environment. You can often see skaters cruising the streets, sidewalks and parks expertly swerving through the crowd. Because of its size, there are no other means of transport more suited for the unpredictability you will find while going around the city. And once you arrive at your destination, you can simply walk and carry your board without having to search for a parking spot or worrying about thieves. Of course, depending on the terrain you’re skating on, you might need to make a few adjustments to your board or wheels, but that’s something any well-equipped skateboard hardware store can handle. Skateboarding is also completely “green.” It’s a sustainable way of transport since it uses neither fuel nor electricity and emits no gases. Skaters are by default some of the most interesting, inclusive, quirky and fun people you’ll ever have the chance to meet. At the skate park, a shared love of skating conquers all differences and brings everyone together. Skateboarding can also bring kids closer to their parents and establish some new neighbourhood friends. It builds bridges between generations, genders, different races and social backgrounds, ultimately bringing people together and offering a great outlet to meet new people. As you can see, skating is one of the best and most beneficial activities you can do for your body, mind, soul and our Mother Earth. So, if you want to give it a try, don’t hesitate. Grab a board, head outside and get rolling. There’s no way you’ll regret it. Luke Douglas is a fitness and health blogger at Ripped.me and a great fan of the gym and a healthy diet. He follows the trends in fitness, gym and healthy life and loves to share his knowledge through useful and informative articles. Chat with him more via Facebook and Twitter.